Smoky and rawboned, Tadec is an eerie and unsettling little fiend. Inspired by Watership Down - please see note below. Limber and shifty, Tadec is a ghostly little moonlighter on spindly stilts. He far more closely resembles his coyote ancestors in size and build. He is gaunt, appearing as though his broomstick shape ought not to have the strength to hold him up. Tadec's muzzle is slender and fox-like. From underneath his lip, the tips of yellow canines peak and glint. His eyes are a dull, smoldering bronze #C77014. The majority of his coat is a dark iron coloration #202020, coating the coywolf in shadowed smoke. Along his back, starting at the base of his neck and washing down his shoulders, reaching down his spine, is a rich copper #d06e00. This same color flecks along his shoulders and back in an array of wispy splotches. Tadec is a collector of imperfections in others. He will often pick pieces of your character out and may decide that it is a feature he admires or dislikes. 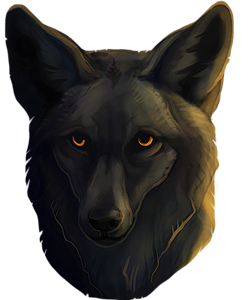 Tadec is - by default - not fond of full-blooded wolves and prefers those with mixed blood or extreme physical differences. Please Note: Tadec is inspired and based on the culture surrounding the novel Watership Down. Though he is a wolf, his beliefs and actions will follow alongside those of the Lapine, with some adjustments. As each Warren in the books was run a bit differently, Tadec and the packs he involves himself are just as different, and will continue to be so. He seeks to craft his own ideal pack with his beliefs. If you would like to play a character alongside him, or from his culture, please reach out to me via PM or on Discord. Email: Send Tadec an email. Current time: April 21, 2019, 05:06 AM Powered By MyBB, © 2002-2019 MyBB Group.